On Saturday or Sunday morning each week, Matt & I spend some time brainstorming about what we want to cook for the week ahead. We try to plan things based on what produce we currently have from our CSA & recently, what cuts of meat we have in the freezer. This week we had some mini sweet peppers that either needed to be used or chopped & frozen. Matt was going to be grinding a pork shoulder for sausage & thought why not use some of that to stuff the peppers. He thought rather that go with the traditional flavors of sausage & peppers he take it on an Asian route instead. This dish ended up being quite tasty. The sauce was a bit on the sweet side which complimented the peppers really well. It was a little labor intensive stuffing all those little peppers. We easily could have gotten the same flavor by chopping the peppers & adding them to the sausage & sauce but the little stuffed peppers made for a fun presentation. Cut the top off of the peppers & remove the seeds. Steam until soft & set aside. Meanwhile, Heat the olive oil & sesame oil in a skillet. Add the onion & garlic & sauté for 1 minute. Add the pork & ginger. Cook until the pork is cooked through. Stir in 1/2 t Chinese mustard, 1 T hoisin sauce and 1 T rice wine vinegar. Stir to coat the pork & let cook for about a minute. Carefully stuff the softened peppers with the sausage mixture. We used a toothpick to hold the sausage in at this point. In the same skillet you cooked the sausage in add 1/2 t Chinese mustard, 1 T hoisin sauce, 1 t rice wine vinegar, and soy sauce. Mix the cornstarch into the water then add to the skillet. Bring to a boil & let cook until thickened. Add the stuffed peppers to the sauce & let cook enough to just reheat. Remove the toothpicks if using. Serve the peppers over rice & spoon sauce over the top. i can just envision the two of you sitting at the table, pondering the variety of foods you want to consume this week. what fun. this is a great dish--so colorful and undoubtedly packed with flavor. nice job! It is a pretty presentation. I love the colors and of course the idea. kat... This sounds incredible! You are definitely giving Stuffed Peppers a well deserved makeover. That sounds really good - I love the cute little peppers! What a great idea! 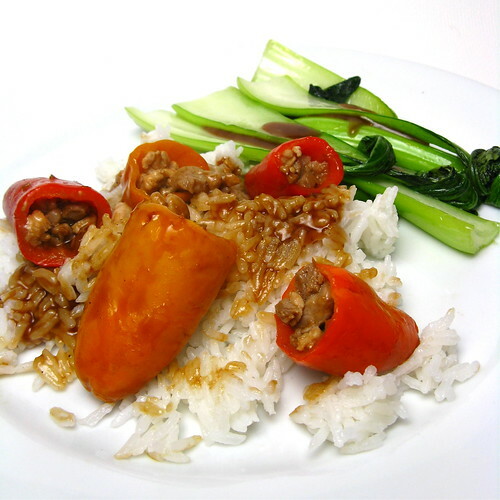 I don't think I've ever thought about doing an Asian stuffed pepper recipe... but it makes a lot of sense, really. Great flavors here! And nice use for what's on hand. I love your stuffed Asian peppers!! The dish looks so tasty!! It must be nice to plan the week's menu as a couple. I am all by myself when it comes to cooking, but sometimes I think that's better, LOL. Those peppers looks so tasty! That looks delicious! Great pictures.